Between blog posts and my fiction writing, I have been putting in some hours getting words on the page lately so, when the evening rolls around, I like to watch an hour or so of TV to let my mind unwind. Of course, some of the things that I watch are back episodes of paranormal shows and, of course again, watching those shows queued me up for yet another blog post. If you have been following the blog for a while, you will know that I am all for people doing paranormal investigation (and I include things like looking for Sasquatch here) as long as they do it in a safe manner. Safety starts in the physical world with using your common sense and staying out of crime ridden neighborhoods and old unstable structures, not trespassing, having survival gear packed if you are going into the woods and so on. I should not even have to mention this but the tragic stories that come out, now and then, about people who are injured or killed because they ignore basic safety precautions encourage me to remind folks to be careful out there. Chasing ghosts and other things that go bump in the night does not obviate the need to pay attention to what is happening on this level of reality. Watching these paranormal shows, though, I am struck, over and over, by the need for investigators to follow some basic energetic safety protocols. I can not count the number of times I heard someone on one of the shows talk about opening themselves up to whatever was going on in the site they were investigating. As I have pointed out, again and again in these pages, you want to know what you are opening to before you make such an invitation. It is the height of idiocy to walk into any haunting, especially one that is being presented as hostile and open yourself to whatever presences are there. Even mediums, who work day in and day out with spirits, know that there are basic protocols to follow when making contact with the Otherworld and that those protocols help to keep them safe. Safety is not gained by trying out your new Shakti Helmet in the midst of a haunting where a young girl is being plagued by a being described as a ‘lady vampire’. While, in actuality, this entity did not turn out to be one of the astral predators that feed on energy, the investigator in this case did not know that at the time that he undertook this experiment. As I have pointed out on a number of occasions as well, safety is also not gained by going into hauntings with a deliberately provocative and belligerent attitude. Such behavior may stir up activity and make for good television but there is a reason why magicians have a saying that one should not call up what one can not put back down. In a very real sense, the paranormal investigators who are walking around, calling out to spirits that are supposed to be in a place are practicing a rough form of evocation that can lead not only to paranormal activity but to attachments and worse. I am minded of one investigator who stated that he was effected for several days after a particular encounter. This should not happen; investigators should, at a minimum, have the tools to cleanse themselves energetically after ghost hunting. Every occultist has favorite techniques for protecting themselves but, if you have no experience in this realm then I encourage you to read Michelle Belanger’s The Ghost Hunter’s Survival Guide: Protection Techniques for Encounters with the Paranormal. Occultists of all stripes love their ‘tech’ and, reading some of the books out there on psychic protection and/or self defense, you might become convinced that you have to become a practicing witch or ceremonial magician to take care of yourself energetically during a paranormal investigation. Ms. Belanger approaches psychic hygiene from a non-denominational viewpoint and allows anyone with an open mind to learn how to work with energy and how to use it to protect and cleanse themselves in the ghost hunting milieu. This is a good book to get the rookie ghost hunter started in protecting themselves and makes a good companion volume for Ms. Belanger’s other book, The Psychic Energy Codex: A Manual for Developing Your Subtle Senses, a book that will get the novice started on developing the sensitivity to know what sorts of energies they are coming into contact with and what level of protection they might need. Sometimes, with some wrathful entities, it is better to back away and re-group than to stay. Be aware though that, in my experience, once you have developed some talent for energy work, you begin to ask “well, what else can you do with this stuff” and the next thing you know your bookshelves and Kindle are crowded with books on esoteric subjects. You have been warned, the rabbit hole awaits!! I was listening to Marie D Jones on Into the Fray radio today and something that she and Ryan Sprague were talking about hit the “I need to write a blog on that” chord. Basically, the discussion revolved around how, in some paranormal cases, one person will experience an event while another will stand to the side and wonder what all the fuss is about. I first noticed this phenomenon in magical circles many moons ago. In the more public era of my pagan life, I participated in quite a number of different rituals. I would often come out of these rituals thrilled at the energies I had experienced only to have someone standing around at the feast afterward saying something like “it was a lovely ritual but I did not feel much”. I remember thinking, in my more youthful hubris, that such people must be “concrete heads” not to have experienced anything in the ceremony. In the same manner, two investigators may walk into a house that is allegedly haunted. One investigator may have multiple experiences while the other sits in the dark all night and experiences nothing, even with a coterie of electronic devices to keep that investigator company. It seems, at times, as though the paranormal is controlled by an intelligence that is determined to leave humans standing, scratching their heads. Given the many legends of trickster spirits, I think there is likely something to that idea but I also think that, often, there is a much simpler explanation of the seemingly random firing of the phenomenon that we study: sensitivity. In the more public period that I spoke of above, I used to earn part of my living doing readings at my local metaphysical book store. I can not begin to tell you how many people I looked at and asked “why are you talking to me, you could be doing this reading for yourself?” Mouths would drop open and expressions of denial would spring to their lips but the truth was that , even though they denied it, these people had a lot of latent psychic ability. You might recognize these folks: they are the people who ‘just have a feeling’ that they should turn right instead of left and avoid an accident, who always seem to know who is calling or who have dreams about things that subsequently happen. They do not think of themselves as psychic since only “those” people (you know the ones with the dark, incense laden parlors, cheesy robes and turbans) are psychic. Whether they own the title or not, these people have enough ‘bleed through’ of their psychic abilities to respond to them, even if it is only at a barely conscious level. On the other hand, you have people who, for one reason or the other, have sealed themselves away from their psychic selves, put those abilities behind a door and throw away the key. I referred to these people as ‘concrete heads’ above and this is a pretty apt description; nothing short of the physical manifestation of the Archangel Michael or a strong poltergeist slapping them in the back of the head is going to get through to these people. Whether it is their upbringing in a fundamentalist setting or simply their fear of being outside societal norms, these folks will not allow themselves to utilize the psychic, at least not consciously. Psychic sensitivity runs a continuum, of course, from those that are aware of their abilities and use then to those that simply refuse to acknowledge psychicsm at all and will consciously ignore any input that does not arise from rational thought. Add to this the fact (at least in my world) that no two psychics are the same and may have quite different modes of psychic perception and you begin to understand why two or more people in the presence of a paranormal phenomenon may have markedly different experiences. Let’s go back to our haunted house and add another ghost hunter. So, we have one ‘concrete head’, one sensitive person of some sort and one person who identifies as a medium. The person who has shut away their psychism will very likely experience nothing or only have vague feelings of disturbance that they may or may not be able to verify with their equipment. The sensitive may feel cold spots, have the feeling of being watched or may actually feel that they have been touched. The medium, if there are spirits present may actually be able to see or hear those spirits and communicate with them. Different level and varieties of psychic talent; different experiences. I would make the argument that it is good to have different types of people on an investigation team. If you have a whole team of mediums on a ghost hunt things are going to get out of hand pretty quickly. On the other hand, a team of concrete heads will find that their investigations are, for the most part, not very interesting. If you have different levels of ability on a team though then you have the opportunity to cross check what is going on around you. If the medium on point says that they feel a spirit in a location and the concrete head tells you that there is a twenty degree temperature drop in the area the medium is pointing to then you can be pretty sure something is happening. If the concrete head is even feeling a vibe about a place, then you might want to hold your medium in reserve or have them go in shielded to avoid over-taxing them. Here is a picture of the newest addition to my family. As of this writing, we have not decided on a name yet but he came from rescue called Nato so that is what we are using for now. He was a stray, found and dropped at a high kill shelter with an embedded harness requiring surgery. The outlook was pretty bleak for him until a local rescue organization picked him up, got a vet to treat him and then put him up for adoption. This is one of my personal crusades. Although I love pure-bred dogs like Golden Retrievers and Irish Wolfhounds, there are so many dogs of mixed heritage that need homes that I can not, in good conscience, do anything but rescue when I need a canine companion. My last dog, who passed over in December, was a rescue from the pound local to us at the time. She was a Border Collie mix who went on to work search and rescue and to be a faithful companion for thirteen years. We knew we could never replace her but we also knew that we missed having dog energy around so, after giving ourselves a little time to mourn, we started checking Petfinder and found this little fellow. Now, here is the interesting part for all you magical / Fortean / paranormal folks out there. Nato had not been in my apartment more than a couple of hours before he stopped playing (he is very much a prey/play driven pup), sat down and stared at the space around my protection altar, cocking his head and very cutely letting me know that he could see and/or hear the house protector spirits. I politely asked my spirit guardians and ancestors to accept him into the family and he went about his merry way. It seems to me that I once saw a ghost hunting team on TV using a dog as a detection device. There is something to be said for this idea. Dogs have a long history in the lore of strong association with the dead and liminal places. Dogs also have senses that detect things in ranges we could not even imagine, both visually, aurally and olfactorily. There is a reason that police officers and special forces personnel use dogs as part of their arsenal; dogs can detect danger much earlier than a human and, if properly trained, will alert to it and even go after the source. In much the same manner, most books on psychic and magical protection will tell you to watch animals in the house, particularly dogs and cats, for unusual behavior if you suspect the presence of unwelcome spirits or magical energies. In my own experience, this usually entails repeatedly going back to a particular spot, staring, ear twitching, abnormal aggressive behavior such as growling or teeth baring or abnormal fright behavior such as tail tucking, ear lowering and crouching. If your normally confident and outgoing dog, stands and stares at a spot in your house (or elsewhere), suddenly drops his tail and ears and slinks away or begins barking and showing teeth for no apparent reason then you might have a spirit incursion or strong concentration of negative energies that needs to be sorted out. Remember to be sensible and check for mundane reasons for the behavior (you might simply have mice in the walls) but, if you can find no logical reason why this behavior happened and, especially, if it continues, then you might want to seek professional help or at least take up a regular banishing practice until it resolves. While I never encourage people to ‘freak out’ about spirits and magic, acknowledging that most things can be banished by laughter, I also strongly encourage people not to ignore these things and hope that they go away. Many haunting and curse stories start with an pet being unaccountably upset and then progressing to manifestations that the humans sense. View your animals and particularly your ever-faithful dogs as a valuable early warning system in times of psychic trouble just as you count on them to alert you should someone burgle your home. It seems that Wisconsin, Manwolf hunter Linda Godfrey’s home state, is just rife with mysterious canids. Monsters and Mysteries in America, Season 3, Episode 6, aired on 25 February 2015 and included a fascinating piece on the ‘hellhounds’ of Meridean Island in Wisconsin. I’ve done significant research on the Phantom Black Dog most commonly seen in Great Britain and found this segment, which begins around 29:00, quite fascinating. I am not entirely happy with Monsters and Mysteries – too much effort, in my opinion, to overstate the case for the phenomenon that they cover and to be ‘spooky’– but the show has done a good job of trying to find fresh stories that may not have seen coverage in other paranormal shows. This hellhound case in Wisconsin is a good example. It seems to me that I might have run across it in some of my digging (I would have to go back and look through notes) but it is certainly not a site that I am familiar with. The hellhound segment of the show featured two sets of witnesses: a couple, Shelly Touchstone and Chris Wiener, who were reportedly just looking for a secluded spot for some time away from the kids, and two young paranormal enthusiasts, Mike Bagozzi and Jeremy Stark, who actually went to check out the purported sightings at the boat landing on Meridean Island. Of course, we have no way of really evaluating these witnesses but, in the show, they appeared sincere and I found it telling that their stories had some striking resemblances: the fog, anxiety and the limits of the chase. Both sets of witnesses stated that, before there was any manifestation of the devil dogs, a dense, cold fog enveloped them. I find this quite telling since fog and other suddenly occurring weather disturbances can be a signal that a door to the Otherworld has opened. I have personally stood on a hilltop while a puja (Buddhist offering rite) was in progress and watched storm clouds ‘bend’ around the area where the rite was occurring, leaving a rain free hole right above the area where we stood. In addition, I have seen fog and mist form, seemingly out of nowhere, during the invocation of certain deities and in the presence of what we might term the Faery. A cold, dense fog might certainly form naturally in the vicinity of a river but the timing of these fog event seems a little suspect given the subsequent events. I also noted something that I have written about in another blog post – that feeling that something is amiss. I have stated before that often a gut feeling that something is wrong is a good sign that it is time to vacate the premises or, at least, be prepared for a paranormal action. In this case, both sets of witnesses had some intimation that all was not well before their encounter. The young couple, distracted as they might have been by having some alone time together, still alerted at some point before the event and began to feel anxious. Mike Bagozzi, one of the young would-be investigators, stated that he actually became anxious five miles before he and his team mate got to the boat landing. His anxiety was such that, according to him, he refused to turn their vehicle off, left the vehicle in drive and had cut the wheels so that they could make a hasty getaway if needed. Intuition is a tool that is much needed but often discounted in today’s paranormal investigation scene. While Touchstone and Wiener never actually saw anything, only hearing the phenomenon, Bagozzi and Stark reported seeing an apparition of Mary Dean (the ghost who supposedly haunts the isle) as well as a ragged looking black dog with glowing red eyes that then gave chase. In both incidents, however, the human response was clear; both pairs of witnesses fled for their lives. Interestingly, once the witnesses had driven at ridiculous speeds up the dirt road that led to the boat landing and gotten back onto the paved road, the pursuit ceased as suddenly as it had begun. This seeming limitation on the hellhound’s range is something that we see repeatedly in the English stories of the Phantom Black Dogs (PBD) where the creature will materialize and walk alongside a wagon or vehicle from point A to a clearly defined point B, where it turns aside or simply vanishes. 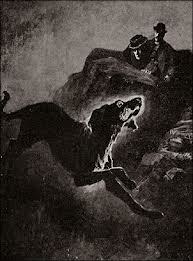 The hellhounds of Meridean Island bear a strong resemblance to the classic PBD of English lore. Those who have seen them describe them as being “big as a bear” with glowing red eyes while the English stories tend to describe the PBD as the size of a calf, again, with glowing red or yellow eyes the size of saucers. Extensive folkloric examinations of the PBD have shown them to often be associated with water, such as the Chippewa River where Meridean Island is located. In addition, the lore of the PBD associates these interlopers from the Otherworld with death and the dead, a theme we see with the story of Mary Dean and reported hauntings throughout the Carysville, WI, area. While Monsters and Mysteries in America would have us believe that the hapless witnesses would have been snacks for the terrible beasts if the humans had not gotten to their cars quickly enough, I doubt that this would have been the case. Even in cases where the PBD has caused harm, such as the incident at Bungay, it did not do so by eating its prey. The PBD, in those rare cases where it was the proximate cause of death, seems to just strike its victims dead and leave them. In most of the lore, however, the PBD is simply a spooky reminder that the Otherworld is only a coursing black dog away and, in some of the more sinister stories, may be a harbinger of death in the family of the percipient. Readers who have been following my blog for a while know that I have a serious interest in the Missing 411 outlined by David Paulides in his several books. Mr. Paulides details stories of people going missing from the end of climbing ropes and vanishing within a matter of seconds, with witnesses only losing sight of the victim for a moment. There are many podcast and Youtube interviews on this subject and I encourage my readers to look one up and listen to what this individual has to say. In the end, it may end up saving you from a lot of heart ache. I worked as a volunteer in wilderness search and rescue and have a good idea of the things that can go wrong out the bush. I know that lack of preparedness and sometimes just plain bad luck can kill people in the wild but I also know that people who meet such misfortune do not simply vanish. There are traces left behind and those traces can be followed by a skilled tracker and/or tracking dogs. In these cases, it is as though the person stepped into the void, never to be seen again, and that the National Park Service, for reasons of its own, has decided that missing persons cases do not merit tracking. Today (19 March) as I sat to meditate, I became aware of the presence of one of my spirit helpers. I had recently finished another book on missing persons (review soon to follow) and must have had the plight of these people stirring in the back of my mind. I asked the spirit to take me shamanically into one of the cluster areas described in Mr. Paulides’ work and was told in no uncertain terms that this would not happen since I was not “dressed for battle”. Given some of my experiences while “out”, in dreams and vision, I thought it best to take the spirit’s word. Nevertheless, this helper was more than willing to discuss this phenomenon. He showed me, in a sort of mini-vision, a wooded area and then, in rapid succession, a series of events that could befall someone and make them disappear. Honestly, the “download” came so fast that I could not keep up but here are but a few of the things that could have befallen the missing. This list is not, by any means, exhaustive. * It is well documented in Faery lore that there are entrances to the Otherworld on the face of this planet, most often located in wilderness areas. Some of the missing could have wandered through one of these portals, which are notoriously hard to see and then to escape from, and been lost to the Otherside. In some cases, victims may find their way out (or be ejected) some time later and such persons would certainly be confused and unable to recall exactly what happened to them, just as a person may lose the memory of a dream or vision. * I was very clearly shown one of the Intruders, moving from the astral, through the etheric, gathering form and seizing someone from a trail and pulling them back to the Otherside. While the being I was looking at had a specific form, I was given to understand that, just as in our world, there are ambush predators of varying sorts that have the ability to enter our world when circumstances are right. 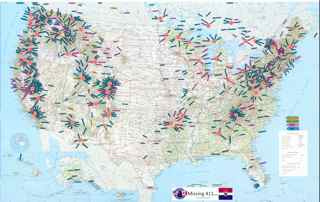 * The spirit tells me that some of these disappearance are human in origin. He would not say much about this other than to point out a strange dream I had a while back about secret government bases in the forest. I am not a big conspiracy buff but we can not ignore the fact that governments sometimes prey on their own people and that there are camouflage and cloaking techniques available that make people able to walk in the forest in near invisibility . . . and that is just the tech that we know about. * Finally, I was reminded that, not only do the woods house humans who have gone feral, so to speak, but that there are human predators out there (serial killers) who are very crafty, very careful and quite willing to steal people when they can get away with it. Mr. Paulides, in his various appearances, has recommended that people not hike alone, that they carry an emergency transponder and that they actually arm themselves before going into the woods. I think that this is all fairly good advice, though I have reservations about the use of firearms. I think it is important to note something here though. If you are taking some or all of these precautions then you have established a mindset. You are not going into the woods unaware but are cognizant of the fact that there might be things, both Otherworldly and human, that could harm you. That awareness and your preparations take you out of any sort of unaware or victim mental status and, in my view, go a long way toward preventing an incident. All of the predators above, human or otherwise, seek to work in stealth. Your focused awareness makes you less susceptible to interference as well as increasing your enjoyment of the outdoors.